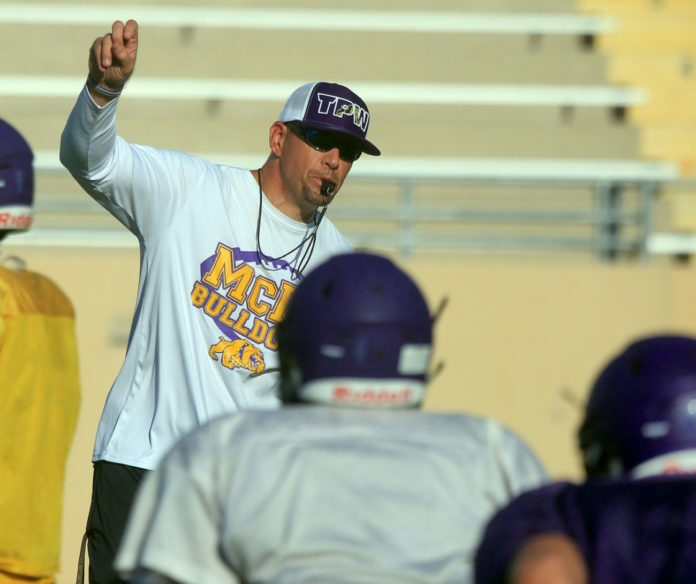 McAllen High coach Kevin Brewer stepped down as head coach of the Bulldogs on Tuesday. His time at the program comes to an end after replacing Tony Harris as bench boss in 2013. In Brewer’s first year at the helm, the Bulldogs went 9-1 in the regular season, which was their best record during his tenure. That season marked the first year McHi won an outright district championship since 1989; the team was then upset in the first round against Brownsville Rivera. In 2014, McHi went 8-4 overall and won a bi-district game against Laredo Alexander before falling to playoff pest Rivera again in the area round. Brewer went 31-34 overall at McHi, but the struggles increased with time. In the past four seasons, McHi made the playoffs twice and missed twice while going 16-28 overall. “I felt like it was time for me to move and allow McHi football a different opportunity to grow and get better,” Brewer said. McHi was 2-8 overall in 2018 and 1-6 in 30-6A play. The school district released an official statement Tuesday morning. The coach, a former TCU student-athlete, was at McHi during a time of success across many sports at the storied program. Division I athletes graduated from his football team, statewide accolades came to Bulldogs swimmers and soccer teams. “When you’re at McHi, you really feel part of a family there,” Brewer said. “From the faculty to the student body, to the administration, the parents, the fans, everybody – it’s all Bulldog Nation. It’s been so much fun and I’ve been so fortunate and blessed. Brewer had the chance to coach his son, Mason, who played defensive line for the Bulldogs. McAllen High Assistant Athletic Coordinator Ruth Garcia will oversee McAllen High athletics until a new Head Football Coach/Athletic Coordinator is hired, according to the MISD press release.